I have a big Belgian waffle maker…the kind that does two at a time. It mostly lives in the storage room, but I did drag it out for Devil’s Food Wafflets with Chocolate Sauce. I found that with little bitty wafflets, it can make more like ten at a time, so it didn’t even see daylight for long! 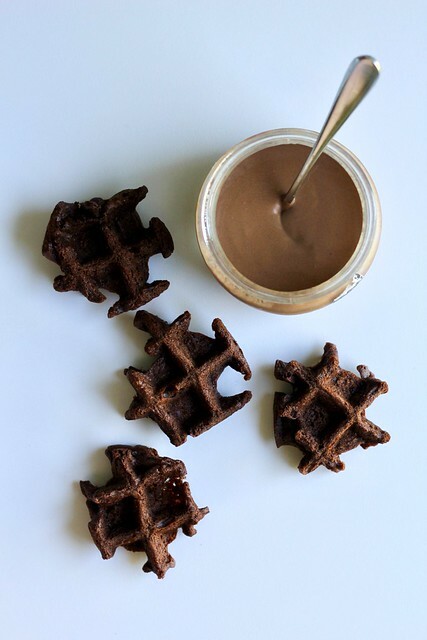 These wafflets are made with a devil’s food cake batter and they get crispy/soft in the waffle iron. Dorie has some optional instructions to really dry them out and make them crunchy through and through in a low oven, but I opted to keep them as-is, like toasted cake bites. I liked these best like little ice cream cake bites, with a spoonful each of caramel ice cream and chocolate sauce. It may be all about dinner on Thursday, but somehow this year I’m not cooking the turkey, so I get to focus on a lazy holiday breakfast instead. The next few days are gonna be go-time at work, cranking out orders for pecan and pumpkin pies and cranberry upside-down cakes. I know already that it will be pastry versus the savory kitchen, battling for space in the one convection oven we have. If I come out alive, sleeping in and having breakfast at home will feel good after all this. 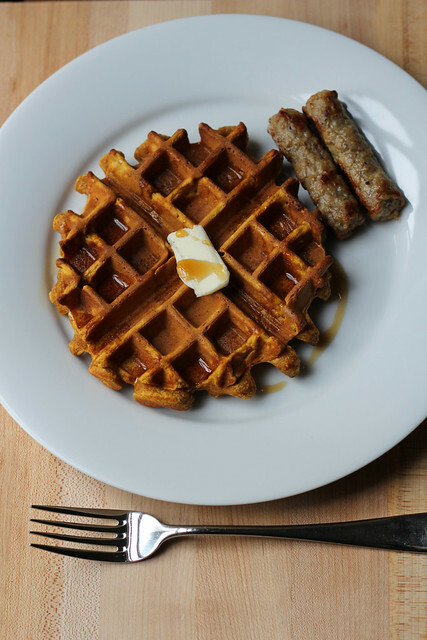 Waffles are a perfect way to use up that open can of pumpkin we always seem to have in the fridge this time of year. And I don’t use my waffle iron that often, so making them seems a little more special than pancakes. 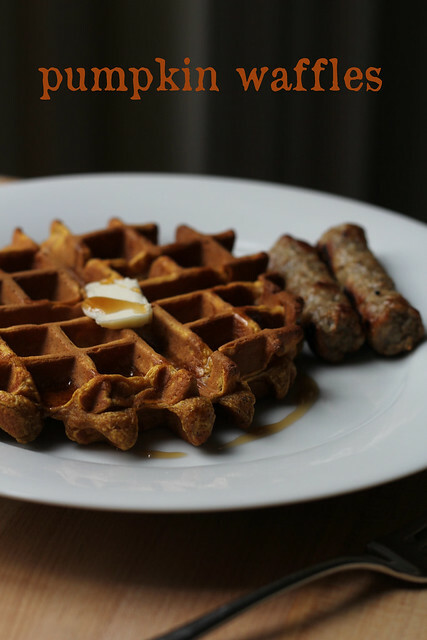 These pumpkin waffles have all the usual warm spices I associate with pumpkiny treats, and they cook up to that beautiful rusty orange color of autumn leaves. Maple syrup is my normal waffle topping, but I’m kind of thinking that cranberry sauce would be pretty good, too. Steph’s Note: Don’t have a kitchen scale? This recipe with volume measurements can be found here. 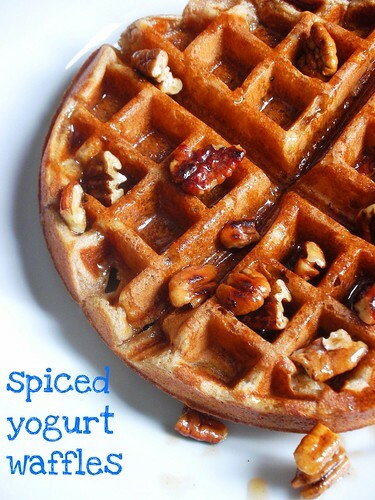 -Heat the oven to 200°F and heat a waffle iron, preferably a Belgian waffle iron. -Combine brown sugar and cornstarch in a large bowl. Whisk together to break apart the cornstarch. Add the remaining dry ingredients, and whisk to blend. -Separate the eggs– yolks go in a medium-sized bowl and whites get set aside in a smaller bowl. -Add pumpkin and milk to the egg yolks. Whisk to blend and set aside. -Whip egg whites with a hand mixer on high to stiff peaks (you could do this by hand instead)– about 1 1/2 – 2 minutes. Set aside. -Pour melted butter into the yolk/milk/pumpkin mixture. As you pour, whisk to combine. -Add the pumpkin mixture to the dry ingredients, and mix them together until just combined. A little lumpiness is fine. That will smooth out when the egg whites are added. -Slide the whipped egg whites out of the bowl and onto the mixture you just prepared. Gently fold them in until no white bits are obvious. -Brush the waffle iron with a little vegetable oil. Working in batches, cook the batter in the waffle iron according to the manufacturer’s instructions until crisp and golden. Set the waffles directly on the oven rack to keep warm. Do not stack them. -Serve the waffles with the syrup and butter. 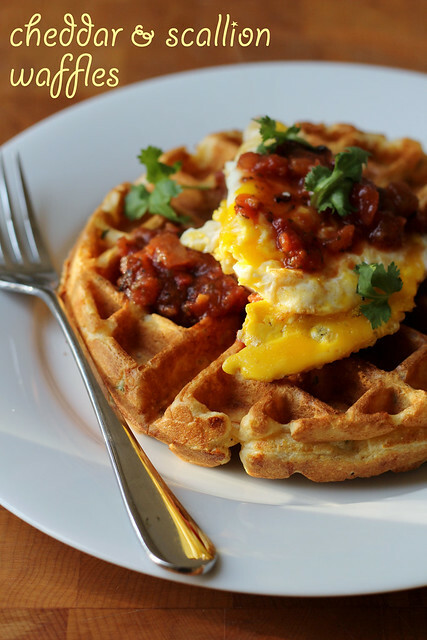 You can freeze leftover waffles to recrisp another day. Usually I don’t work on Fridays. Typically I have the day to myself. Sometimes I do errands or shopping. Occasionally I can find a friend to escape work and have lunch with me. Always I eat breakfast and watch episodes of House Hunters. Breakfast du jour was a Savory Cheddar and Scallion waffle topped with salsa, sour cream and an egg. I treat myself right, don’t I? Actually I just pulled the waffle out of the freezer and reheated it. It was leftover from a “breakfast for dinner” night earlier in the week. 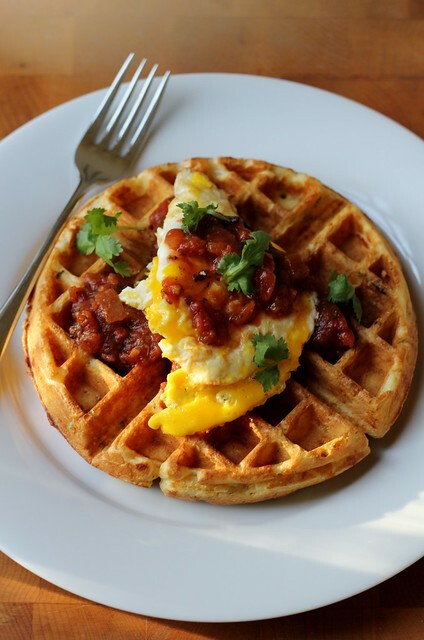 That’s the beauty of a savory waffle…perfect for brekkie or dinner. It’s not weird, trust me. This one has a bit of a Southwestern twist to it– some cornmeal, scallions, cheddar, cilantro and hot sauce (I use a heavy hand with the Crystal). I was worried that the cheese might adhere to the waffle iron and act like superglue…it didn’t. I had beautifully formed, crisp-edged waffles with buttermilk tang and a savory flavor. I’m trying to use my waffle iron more often. After I get past the annoyance of removing it from its styrofoam and box (yes, OK, I am an original packaging hoarder), making waffles is really fun. And eating them, even more. -Heat your oven to 200°F and heat your waffle iron, according to the manufacturer’s instructions. Grease it with a little vegetable oil if it needs it. -In a large bowl, whisk together flour, cornmeal, baking powder, baking soda, black pepper, sugar and salt. -In a medium bowl, whisk together the eggs, oil, hot sauce and buttermilk. Add the wet ingredients to the dry ingredients, then add the cheese, scallions and cilantro. Stir until just incorporated. Try not to over-mix the batter. -Cook according to your waffle machine instructions. Hold the finished waffles in the warm oven while you make the rest. -Garnish as you wish (for me, it was salsa, sour cream, an egg and some extra cilantro) and serve immediately. If you have extra waffles, wrap them well and freeze them…they can be recrisped in the toaster or oven. Since we moved back to Brooklyn, I’ve been going out for a lot of Sunday brunches with my BFF, who handily lives about a twenty minute walk away. I like having breakfast made for me, and a spicy bloody Mary in my hand while I catch up with a friend. But, truth be told, most of what I shell out hard-earned $$ for at brunch, I could make just as well (and sometimes better) at home. When it’s too cold out and the snowbanks are too high to scramble over, I do just that. I don’t take my waffle maker out of its box very often (in fact, the last time I did, it was to make these apple ones), but sometimes the urge strikes to switch things up from eggs or pancakes. I always have yogurt in the fridge, so I wanted to give this recipe a try. The warm spices and pecans also sounded pretty good to me on a chilly morning. I read that some folks thought they didn’t turn out crispy enough, so I gave mine a few extra seconds in the iron to make sure that wasn’t an issue. Bring on the maple syrup, and I think I just may keep the waffle maker out for another week!! Steph’s Note: The number of waffles you get will depend upon the size of your maker. This recipe halves well, but I like to wrap up extra waffles individually and freeze them. They can then be re-heated and crisped-up in the toaster or oven. 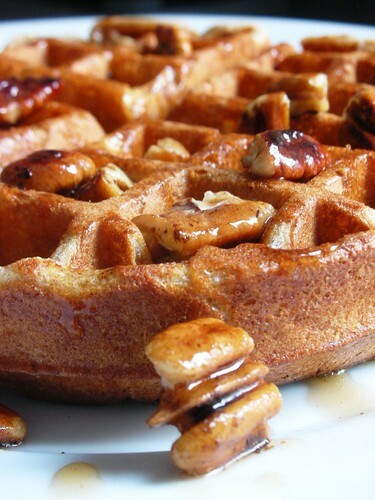 -Heat the oven to 200°F and heat a waffle iron, preferably a Belgian waffle iron. In a small bowl, combine the flour, sugar, cinnamon, baking powder, baking soda, salt, nutmeg, and cloves. In a large bowl, combine the yogurt, milk, egg yolks, vegetable oil, and vanilla. -In a medium bowl, with a wire whisk or electric hand mixer, beat the egg whites to soft peaks. -With a spatula, gently fold the dry ingredients into the yogurt mixture until just combined (the batter should be a little lumpy). Fold the whipped egg whites into the batter until just incorporated. -Meanwhile, in a 2-quart saucepan, warm the maple syrup over medium heat. Stir in the pecans and keep warm. -Serve the waffles with the syrup.